1 of 5 a day. Wriggly, twiddly tasty fun. Packed with real fruit. Gluten free. Suitable for 12 months+ to grown ups. No gluten, milk, nuts or egg. No added sugar or salt. No artificial flavours, colours or additives. No added preservatives. Suitable for coeliacs, lactose intolerant and vegetarians.Our super tasty Fruit Wriggles are made from yummy fruit and juice, with a little pectin to hold everything together. Packed in perfect snack sized portions Fruit Wriggles are great for snacking, treats and parties. Try them in home baking too. 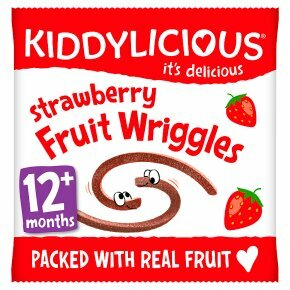 KIDDY CARE: Kiddylicious Fruit Wriggles are specifically developed for children over 12 months. Always supervise young children whilst they're enjoying them.